Cleanses and softens the skin. 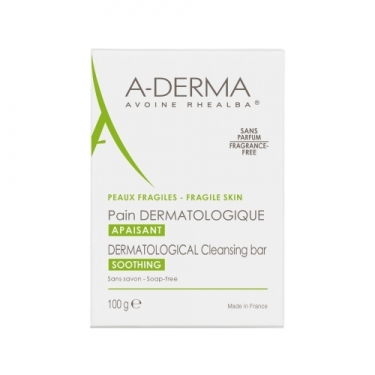 DESCRIPTION: Pain Dermatological Bar from A-Derma is a care that gently cleanses and calms fragile skins. A soap without soap that respects the film hydrolipidic and the cutaneous ph. A solid dermatological soap for daily hygiene of the face and body, without soap, without perfume, without alcohol or preservatives, which respects the skin and prevents dryness.